Kitchen remodeling is an emotional roller coaster ride that can last for 8-12 weeks or more. At the beginning, there’s the anticipation, with some fear — mostly about getting the results you want without making expensive mistakes. The process can bring up hidden differences of opinion (husband wants one thing, and the wife has been dreaming about something totally different). During a kitchen remodeling, you’re dealing with the upheaval of your daily routine, and you’re putting up with dust and mess that can be overwhelming. You have workers coming to your home every morning. But there’s the excitement of choosing products that you know will improve not only your home, but your life. If you’ve established a reasonable budget, kept an ongoing spreadsheet, and made necessary tradeoffs, you feel confident. You know that you can afford your beautiful new kitchen! In my experience, almost everyone hits a low about the time that drywall is being installed. They’re tired of the entire process, and just want it to be done. This is when tempers can flare and serious arguments happen. Many times in my 33-year career, clients have called to express their frustration and anger. It’s even happened to me and my husband! But after the drywall dust is cleared, it gets exciting again, because that’s when things really start to happen, and you can see the finished project unfolding. Your new kitchen gets a first coat of paint. Cabinets are installed, and your heart sings with joy. Your dream is becoming a reality! A couple of weeks later, your new countertops get installed, then other finishing touches. 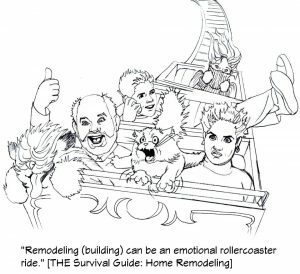 There’s just one more sharp curve looming in your roller coaster ride, your new floors. If you’ve chosen hardwood plank floors, they must be finished and stained, which takes about a week. You are forbidden to go into your new kitchen. All you can do is stand at the doorway and admire your new kitchen. After the floors are installed and finished, your contractor installs the appliances, light fixture trim, outlets, and your gorgeous new faucet(s). You absolutely love your new backsplash! It was worth the extra money to get exactly what you wanted, an expression of your personal taste. This has been an exciting emotional roller coaster ride. You’re happy that you did it. But if a friend asks you,”Are you going to go through this again?” you will probably reply, “No!” But you know that the bathrooms in your home are showing their age, and there are things you’d like to do . . .
To help you understand all the ups and downs, twists and turns that you’ll be going through. To be there with you from the beginning to the end of your personal roller coaster ride. To help you avoid expensive mistakes and make informed decisions to assure that your kitchen (or bathroom) remodeling goes as smoothly as possible. Read about award-winning author and designer Diane Plesset — her philosophy, experience, and training. © 2016 D. P. Design — All Rights Reserved.